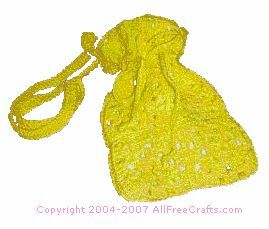 Granny squares work up into a practical crocheted drawstring bag! These are useful for carrying your crochet work with you – or for carrying your toiletries when traveling. Use your leftover yarn or buy some yarn on sale to make the granny squares for this economical crochet project. Rnd 1: Ch 4,sl st in first chain to form ring. Rnd 2: Ch 3, 2 dc in center ring, ch 2 ,3 dc in center ring,repeat ch 2, 3 dc in center 2 more times.ch 2, sl st in top of first ch 3, sl st in next 2 chains. Rnd 3: Ch 3, 2 dc in sp, ch 2, 3 dc in same sp, ch 2, 3 dc in next sp, ch 2, 3 dc in same sp. repeat ch 2, 3 dc, ch 2, 3 dc in same sp, in next 2 sps. Ch 2, sl st in top of first ch 3, sl st in next 2 chs. Rnd 4: Ch 3, 2 dc in sp. ch 2, 3 dc in same sp, ch 2, 3 dc in next sp. repeat round 4 around, sl st in first ch 3, sl st in next 3 chs, fasten off. This is 1 granny square. Make 11 more. crochetpocketbook100 (2K)Thread a large eyed needle with your yarn,and stich together the squares, in the lps, 2 across and 3 down. 6 on the front and six on the back, Now sew the the 2 panels together, on three sides, leaving the top open. With your crochet hook, make a sl st in the corner you sewed together and make a chain long enough to go over your head and lay on you shoulder. Sl st to other corner and turn and dc the chain to corner,sl st and fasten off. This is your handle. Make another chain 3 times the width of the bag. And slip thru the 3rd level from the top of the front of the bag, around the holes back agin to the front. Take a 2 piece of solid material the size of the bag with a 1/4 inch seam allowance all around. Sew around the three sides and then sew a hem on the top. Do not turn, slip in crochet bag and with thread, sew thru top loops and material. Knot off. Pull draw strings tight and tie a bow.